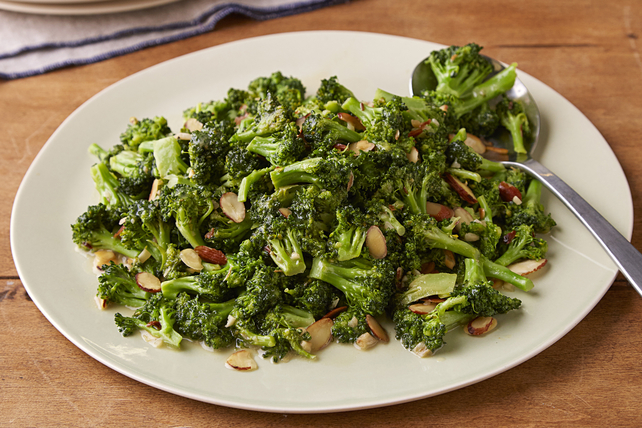 Add some Asian-inspired zip to your menu with our Sweet & Sour Fried Broccoli recipe. Sweet & Sour Fried Broccoli adds a little something extra everyone loves. Heat oil in large deep skillet on medium-high heat. Add garlic; cook 30 sec., stirring constantly. Add crushed pepper; cook and stir 30 sec. Add broccoli; cook 2 min., stirring frequently. Stir in water; cover. Simmer on medium heat 4 min. Meanwhile, whisk vinegar, honey and mustard until blended. Add vinegar mixture to broccoli mixture; stir. Cook, uncovered, on high heat 2 min., stirring constantly. Remove from heat. Add nuts and butter; stir until butter is melted.